The CrossFit Games Open is the world’s premier test of fitness. It is a five-week, five-workout online competition which endeavors to rank the fitness of thousands of competitors, with the ultimate goal of crowning two The World’s Fittest. The Open is designed to be accessible yet rigorous enough for every level of athlete. Workouts are released online each Thursday. Scores for each week must be submitted by Monday. See this https://open.crossfit.com/english for more information and to register! What is the OPEN @ TEMPLAR & what happens on Friday Nights? We all gather at the gym at 5pm and do the Open workout in a competition atmosphere. There are lanes and heats and judges, not to mention an after-party that usually starts around heat 3. You don’t want to miss out! Do I have to be there every week? No, but it’s a ton of fun! 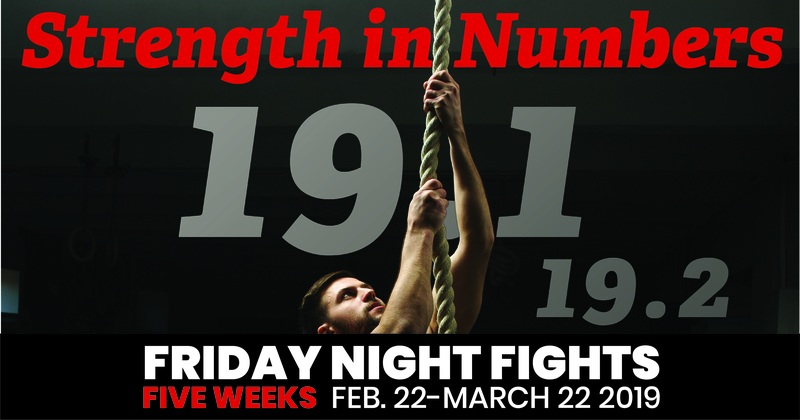 Friday Night Fights are each week from February 22 to March 22. Mark your calendars! Athletes do have the option to complete Open weekly workouts all day Friday, during regularly scheduled classes. How do I get on a team? This year Templar athletes have TWO options. Register ONLY with Templar. Complete the following Google Doc. Register with https://games.crossfit.com/open AND Templar. Complete the following Google Doc. We have simplified the scoring this year (again) …points are awarded for competing, PR’s and participation. I can’t make every (or any) Friday? I don’t feel comfortable “under the lights”? I am not pulling in “top” scores? I don’t like judging? I can’t do a movement? This entire thing terrifies me? I am not competitive? Having a judge makes me nervous? It does not fit into my WOD schedule? If these are your reasons/excuses for not participating DON’T let them be! Templar’s FNF are designed to be encompassing of ALL it’s athletes, schedules and fears. YOUR participation in this years Open can only help your team, fitness and community…. and most importantly yourself! Do I have to take the judges course? It is highly recommended! Athletes in prior years report that taking the judges course is an important way to learn the ins and outs of the movement standards. Do you have any lengthy rule books in technical language for me?